I’m 37 weeks pregnant, that means I’m officially full term which is really exciting!! If you missed my 36 week update be sure to check it out! I’ve had my final midwife appointment on Praslin this week, all went fine. I will have one final check up near to where we are staying on Mahe and then that will be it before I check in to hospital to meet baby boy!! With going to Mahe this Sunday I think this may be my last bump update!! I’m not so sure of our internet access there, if I can get one in next week then of course I will! If not I’ll probably still write it and publish it when we get back to Praslin. That will definitely be weird since we will have our little guy by then but it will be nice to look back on it later on!! Bags are partly packed to go now, I’ve not packed anything for myself yet though!! This week is rolling through so fast, I feel like I’ve got more time then I really do!! We are going to get all toiletries for baby and me on Mahe so it’s one less thing to fly over with! But, as usual it’s pretty much been left to a last minute thing!!! I am ridiculously uncomfortable most of the time now, and my energy is totally zapped! I don’t know how I’d be coping if mark wasn’t home right now!! Sleep is continuing to be really broken which is not ideal but I guess it’s preparing me for night feeds!! I’ve had some really painful Braxton hicks contractions where they’ve literally stopped me in my path. I never had anything like this with Arthur, I guess because he was breach where this little guy is head down so there’s more pressure!? Anyway I try to remain calm when it happens, but I’m not gonna lie, I freak out a little each time!! Arthur has been giving loads of kisses and cuddles to my tummy mostly accompanied with “ahhhhh baby” which is so cute! He’s also been saying “touch” as in touch the baby because we’ve been telling him that the baby will be here soon and showing him where he will sleep and all the little clothes!! So, here’s this week’s countdown to our Caesarian and meeting baby boy!! 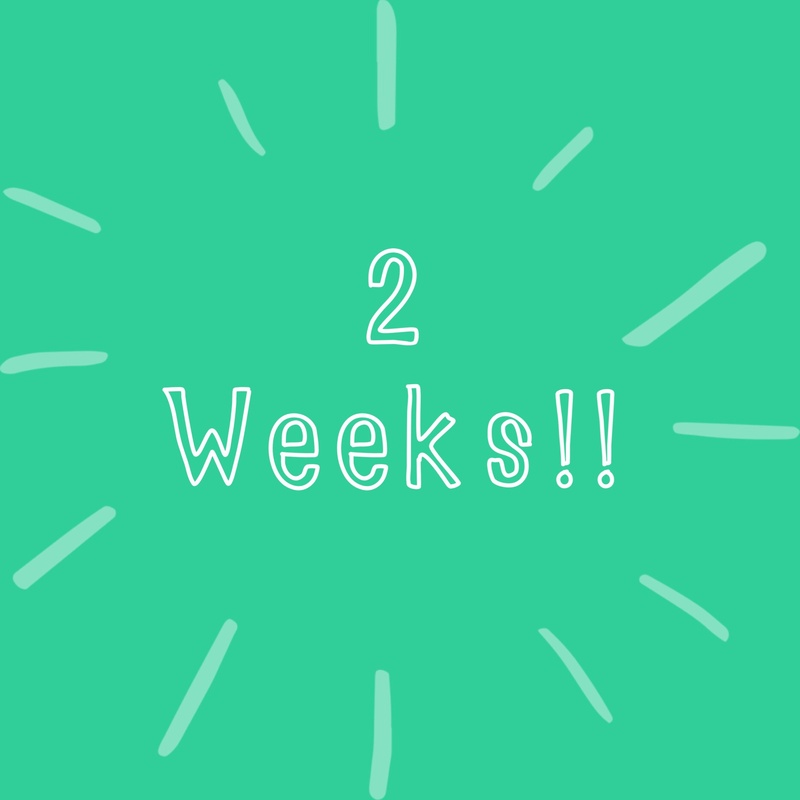 It’s actually closer to one week now, we are so excited!! So, hopefully I can do one last bump update next week if not I’ll be back…..with a baby!!! I’m 34 weeks pregnant! 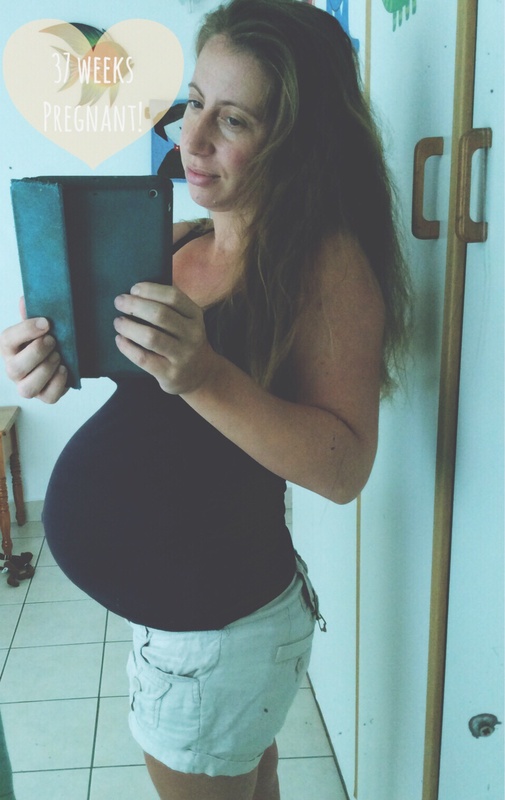 If you missed it, check out my 33 week update. This week has completely flown by! I had my midwife appointment Thursday, I was honestly dreading it after being a bit told off the last couple times for not putting enough weight on! We waited for ages to see the midwife. A lady told me in Creole (the local language) what I thought was that the midwife had gone but she will be back in a few minutes. Perhaps I misunderstood! Anyway, after about 30 mins she still wasn’t back so the midwife who I had with Arthur saw me instead. As I may have mentioned before, she’s a little bit of a dinosaur and very old fashioned! She was quite nice to us this time. As you can see I have put on weight (yay). She did my fundal measurement and I told her that the other midwife said I had been measuring small. She told me my measurement was fine. I think she said it was 34 but then she did check it again and then just said it was fine! I’m booked in for another appointment in two weeks time. I will have another scan the same day. Still getting Braxton Hicks a lot, sometimes it’s quite painful. I told the midwife that I’d been feeling lots of pressure and she said that it was the babies head. Obviously with Arthur being breach I never experienced that!! Arthur has been really cuddly with me this week and telling me to “sit” a lot. I think he’s realising that I’m slow and tired bless him!! We’ve had a few no nap days, one where it resulted in Arthur being mega grumpy and tantrum every 5 minutes which was awful. We’ve also had some lazy cuddly afternoons which is quite alright with me, although I would still really like him to continue to nap!!!! I have been on a bit of a baking mission this week, for no particular reason! I’ve made cookies, shortbread and butterfly cakes (might explain the weight gain!) Mum says I’m nesting! It would be great if my nesting was more geared towards getting organised instead of making us all fat but it’s nice to have yummy treats in the house! Last time round I think all my nesting was used up on getting Arthur’s cot ready! Next week is Mark’s last week at work, we are all very ready for him to be finished! We then will have two weeks before we go to Mahe. Those two weeks will be full of organising everything in preparation for baby boy! Woohoo can’t wait to meet our little guy! I’ll be back next week with my 35 weeks update!